There was an owl like this right outside the front window the other day. I thought it was a hawk from behind until it gave us the full Linda Blair head turn. So cool! Input text: a [tree] backdrop. a 1st dull owl faces back. a 2nd dull owl is -3 foot in front of the 1st owl. 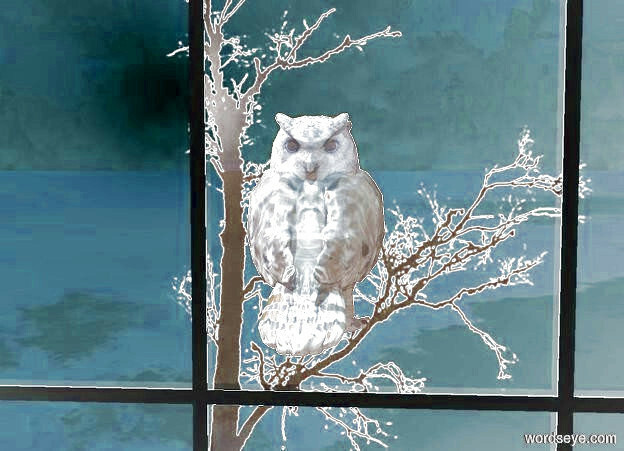 a small window is 3 foot in front of and -1.6 foot beneath the owl. a sienna light is in front of and above the owl. so beautiful, owls are such interesting creatures!